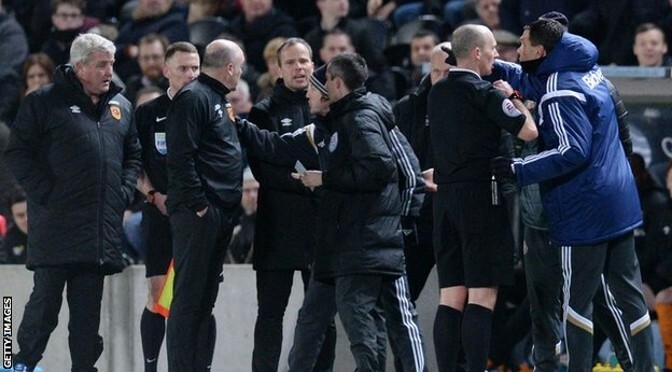 Sunderland manager Gus Poyet was sent to the stands as his team came from behind to earn a draw at Hull City. City boss Steve Bruce and Poyet had to be separated after a touchline argument as the Uruguayan left the pitch. 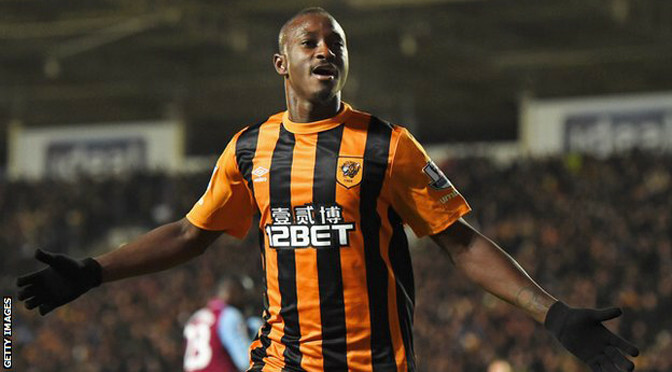 Dame N’Doye opened the scoring for Hull, back-heeling past Costel Pantilimon in the first half. Jack Rodwell scored the equaliser, nodding in from a Patrick van Aanholt cross, with the ball also appearing to strike his hand. The result leaves both sides still separated by a point, with Hull 15th and Sunderland 16th in the Premier League table. The early signs suggested Sunderland would be the more likely to take home all three points, but Hull grew into the game and created the clearer chances. However, neither side had the performance required to distance themselves from the relegation zone. Eighteenth-placed QPR are five points behind Hull, with two games in hand. After his side had gone behind to N’Doye’s opener, scored from a Tom Huddlestone free-kick, Sunderland manager Poyet reacted with frustration to referee Mike Dean’s decision to punish Rodwell with a yellow card for simulation. The Uruguayan was sent to the stands by Dean, but walked across to Bruce, who appeared to respond angrily and had to be restrained by an assistant referee and members of his coaching staff. With Poyet in the stands, the Black Cats’ second-half performance was much improved, and Rodwell steered home a deserved equaliser after the introduction of van Aanholt and Ricardo Alvarez changed the game. With Hull goalkeeper McGregor beaten, Rodwell met Van Aanholt’s cross with a headed effort that appeared to brush his own arm inches before crossing the line. Rodwell then could have scored a winner, volleying over when well-placed, but a Sunderland win would have been harsh on Hull, who only lacked a finishing touch to their enterprising play. James Milner salvaged a point for Manchester City against Hull but could not stop his side falling seven points behind Premier League leaders Chelsea. 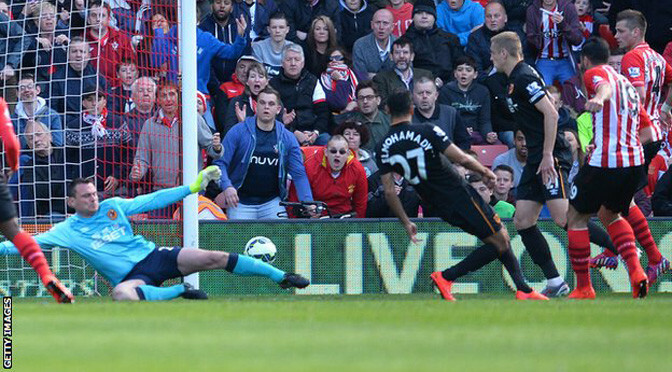 The visitors took the lead when David Meyler slotted in after Gaston Ramirez’s shot struck the post. The home side rallied after the break and Edin Dzeko’s shot was palmed away by Tigers keeper Allan McGregor. Sergio Aguero’s shot hit the Hull crossbar before Milner scored with a curling free-kick in stoppage time. There was little room for error for City as they chased Chelsea, who won at Aston Villa, but they paid the price for a lethargic first half. City were again without Yaya Toure, who is on Africa Cup of Nations duty with Ivory Coast, and they are winless in all five Premier League matches their influential midfielder has missed this season. The home side’s manager, Manuel Pellegrini, will also have concerns about his side’s home form, with three of their four league defeats in the current campaign coming at the Etihad. Hull moved out of the relegation zone but their players were dejected afterwards as they failed to hold on to a lead which would have seen them register their first league win at City. Nevertheless, the Tigers produced a disciplined and organised defensive display which will stand them in good stead ahead of games against relegation rivals Aston Villa and QPR. As well as struggling in defence, Steve Bruce’s side have had problems in attack but, despite having failed to score in 11 of their previous 15 league matches, the visitors almost took the lead. Robbie Brady whipped an out-swinging cross to the far post where Hull midfielder Ahmed Elmohamady and City left-back Gael Clichy both seemed to make contact with a header which came back off the bar. The home side failed to heed the warning and were soon behind. A poor clearance from City centre-back Martin Demichelis fell to Tigers midfielder Jake Livermore and, with City keeper Joe Hart out of his goal, he tried to guide in a shot which was saved. However, after City failed to clear their lines and a Ramirez shot hit the post, Meyler latched on to a loose ball to slot Hull in front. The game developed into a battle between the home side’s attack and Hull’s defence after the break. City struggled to find the creativity to break down a resilient Hull with Dzeko’s shot a rare occasion when Hull keeper Allan McGregor was called into action. Visiting centre-back Alex Bruce survived giving away a penalty for a clumsy push on David Silva, while Aguero’s effort came off the face of the crossbar before Milner struck. West Ham gave their European ambitions a timely boost as a superb second-half display saw the Hammers thrash struggling Hull 3-0 at Upton Park. Sam Allardyce’s side were booed off at half-time after a dismal opening period but Hull paid the price for some lacklustre finishing as Andy Carroll, Morgan Amalfitano and Stewart Downing all found the net after the interval. The result sees West Ham climb above Liverpool into seventh and puts more pressure on Hull manager Steve Bruce, who has now overseen just two wins in 15 Premier League games. West Ham were dreaming of the Champions League when they sat fourth in the middle of December but four league games without a win, including draws against West Brom and Swansea, had dampened expectations. This victory, however, puts the Hammers back in touch with the top four and was particularly important given their next seven fixtures include Liverpool, Manchester United, Southampton, Tottenham, Chelsea and Arsenal. Kevin Nolan’s return was the only change to the West Ham side that played 120 minutes before beating Everton on penalties on Tuesday and it showed, as the hosts were sluggish throughout the first half. Hull’s Sone Aluko proved a menace for the Hammers’ back four with his speedy runs in behind and the visitors should have been ahead early on when his cut-back found Ahmed Elmohamady free in the area, but the Egyptian dragged wide. Aaron Cresswell saw a long-range shot swerve narrowly wide of the post and James Tomkins headed over from a corner but otherwise West Ham’s first-half display was riddled with mistakes and mishit passes. Hull should have capitalised. In the 24th minute, Aluko’s latest spin around Tomkins put the striker in on goal but he took too long and allowed Collins to block the finish. Moments later, the Nigerian was in again and fed Jake Livermore in the box, but the midfielder failed to find Elmohamady, who was free outside him, and West Ham emerged unscathed. Enner Valencia saw his back-post header loop over Allan McGregor and drop onto the crossbar at the end of the first period but that was not enough to spare the home side from a smattering of boos at the half-time whistle. The Hammers came out with renewed vigour after the break and should have scored when Downing pulled back for Nolan but the midfielder fired his half-volley over. In the 49th minute, however, West Ham did take the lead. Valencia unleashed a stinging shot from 25 yards and as Tigers goalkeeper Allan McGregor parried, Carroll outmuscled Curtis Davies to prod home his fifth goal of the season. Having already made two substitutes, Bruce threw 21-year-old defender Harry Maguire up front with half an hour to play but Hull never really troubled their opponents. Instead, it was the home side who looked the more threatening and in the 69th minute so it proved as Valencia slid in Amalfitano and the midfielder coolly dinked the ball over McGregror to double West Ham’s lead. Three minutes later they made it three. Alex Song released Downing with a brilliant through ball and the winger held his nerve, tucking home his fifth goal of the campaign. 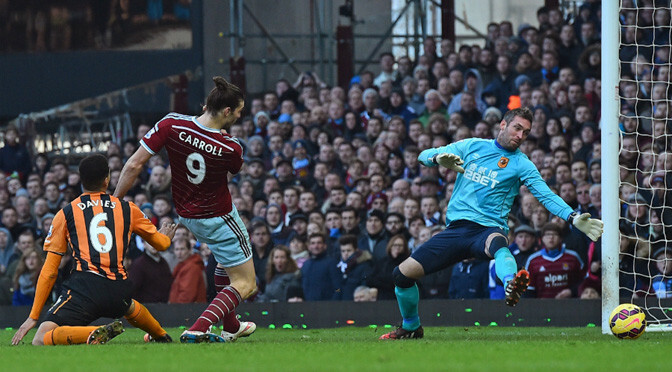 Hull were on the ropes and West Ham could have had a fourth late on. Downing’s clipped ball released Nolan, but the midfielder hit the crossbar from a tight angle and Carroll also went close but the Hammers had to settle for three goals and another valuable three points. 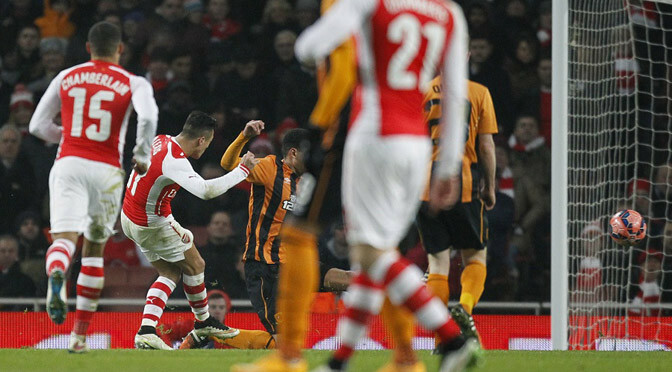 FA Cup holders Arsenal secured their place in the fourth round with a 2-0 win over last season’s beaten finalists Hull. Both teams made several expected changes, as England forward Theo Walcott returned to make his first Arsenal start in a year following a serious knee injury, while Hull switched no fewer than 10 players from their Barclays Premier League win over Everton on New Year’s Day. The Gunners took the lead on 20 minutes through a header from defender Per Mertsacker at a corner, before Chile forward Alexis Sanchez capped another man-of-the-match display with a fine curling effort on 82 minutes which ended any hopes of a late comeback from the Tigers. Arsene Wenger’s men were in need of a response having lost 2-0 at Southampton on Thursday, and almost got off to the perfect start, but Hull goalkeeper Steve Harper made a reaction save with his feet after Joel Campbell was played into the penalty area by Sanchez. Arsenal – who had trailed 2-0 after eight minutes at Wembley before coming back to win in extra-time – remained on the front foot, as Walcott put Sanchez in on the right, but his angled chip dropped onto the roof of the net when the better option was a square pass. After Hull threatened from a couple of set-plays, Arsenal took the lead on 20 minutes after a corner. Sanchez floated the ball in from the left, and Mertesacker got above Curtis Davies to head down over the line. It was almost 2-0 moments later as some quick passing around the edge of the box as Tomas Rosicky released Sanchez, who rounded the keeper but Paul McShane slid in to knock the ball off the goalline. Walcott exchanged a one-two with Santi Cazorla and was chipped clear into the left side of the Hull penalty area, but his sidefoot shot was straight at Harper. On 30 minutes, Hull defender Harry Maguire sent a downward header from a corner goalwards, which David Ospina, replacing Wojciech Szczesny in the Arsenal goal, saved low to his left. The Gunners looked to make a strong start to the second half, with Sanchez making a surging run into the right side of the Hull penalty area before sending in a low, angled drive which Harper saved. Campbell, the Costa Rica forward aiming to earn himself a regular place in the Arsenal side, dragged a shot wide from 20 yards after more promising build-up by the hosts with Walcott then played clear into the penalty area by Sanchez on 66 minutes. However, the England forward – who suffered a serious knee injury in the third round tie against Tottenham this time 12 months ago which ruled him out for the season and also the 2014 World Cup – showed his rustiness as he stabbed the ball well wide. Walcott then almost got on the end of another angled ball from midfield, before Harper raced off his line to deny Sanchez with a block at the near post. It was no surprise when Walcott was replaced by Alex Oxlade-Chamberlain with quarter-of-an-hour left before, on 82 minutes, Sanchez curled in a sublime 20-yard effort to secure Arsenal’s place in the fourth-round draw on Monday evening. 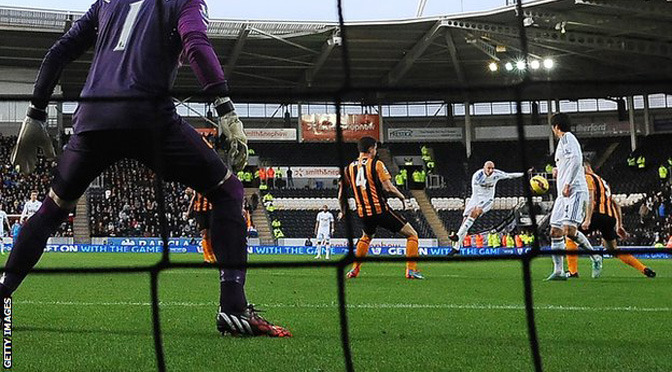 Ki Sung-Yueng’s fortuitous goal was enough to give Swansea a Premier League win over Hull City at the KC Stadium. Jonjo Shelvey’s long-range strike deflected off the South Korean’s wrist to beat goalkeeper Allan McGregor. The pressure is mounting on Tigers’ boss Steve Bruce, who lead the club to promotion during his first season and the FA Cup final in his second, with Hull having won just one game in front of their home fans this term. And it was Shelvey’s long-range shot on 15 minutes that deflected off Yueng to open the scoring. There were only muted appeals for handball from the Hull players and an eerie hush from the deflated home fans. But Swansea have given away 16 points from leading positions this season and they may have feared a repeat when Robertson rattled keeper Lukasz Fabianski’s crossbar with a dipping strike just minutes later. 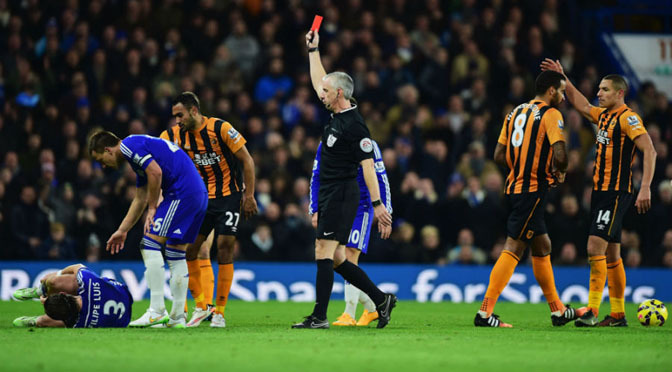 Eden Hazard helps Chelsea to win over Hull as Tom Huddlestone sent off. Jose Mourinho’s men edged their card-laden clash with Hull but it was not one of the impressive, dominant displays Chelsea fans have become accustomed to. Last weekend’s surprise defeat in Newcastle ended talk of the Blues going through the season unbeaten, allowing resurgent Manchester City to close the gap at the top of the Premier League. There were moments against Hull when it appeared this could be another bad day for Chelsea, but efforts from Eden Hazard and Diego Costa saw them triumph 2-0 against a side reduced to 10 men after a wild Tom Huddlestone challenge. The struggling visitors could have no arguments with that decision, but referee Chris Foy is likely to come under scrutiny after handing out seven yellow cards in addition to that second-half red. There could have been more cards had the officials spotted John Obi Mikel’s stamp on Sone Aluko in the build-up to Hazard’s early header, while Hull’s players were furious that Gary Cahill did not receive a second booking for what appeared to be a dive. Chelsea struggled to create much without the suspended Cesc Fabregas but were given a helping hand when Huddlestone saw red, with Costa capitalising to end a four-game scoring drought in all competitions. In fairness to Hull, their performance belied that of a side without a league win in eight matches – and they did well to recover from a bad start. Less than seven minutes were on the clock when Chelsea controversially opened the scoring. A clumsy Mikel challenge on Aluko was missed and play continued, with the ball sprayed out wide to Oscar, whose cross was nodded home by Hazard. It was a bad start which soon got worse for Hull as injury forced Steve Bruce to bring on son Alex in place of the injured Michael Dawson. City responded fairly strongly considering those early blows, with Jake Livermore flashing a strike wide before Aluko missed the target in a move started by Mikel being dispossessed. David Meyler joined team-mate Huddlestone in the referee’s notebook after a comical attempt to hook a corner back into play with a hand, before Willian was booked for taking a tumble as play became stretched. Cahill became the fourth man to collect a yellow card after a late lunge which saw Aluko require treatment – epitomising a scrappy first half in which a blocked Costa effort was the best Chelsea could muster after pulling ahead. The hosts’ sloppy performance continued in the second half, with Livermore firing just wide from the edge of the box after some intricate passing. Mourinho’s side were creating few chances and perhaps that was behind Cahill’s apparent dive in the box. Hull had expected Foy to hand the centre-back a second booking, only to be incensed when the referee pointed for a goal-kick. The City players harangued the official, who was soon under pressure from Chelsea after Alex Bruce smashed through Willian. The substitute was only given a booking – the same punishment dished out to Costa for diving soon after, despite having clearly been caught by Huddlestone. One decision Foy definitely got right, though, was the red card meted out to the former Tottenham midfielder with 30 minutes remaining, after a late lunge on Filipe Luis. Shortly before becoming the latest player booked, Chester escaped calls for a penalty and Hazard struck a shot straight at Allan McGregor. It was 2-0 in the 68th minute when Hazard followed a long run by playing a lovely one-two with Branislav Ivanovic, before putting through Costa to turn home. Oscar and Cahill saw efforts blocked in quick succession, before Ivanovic fired over and a dangerous Willian cross evaded his team-mates. Substitute Andre Schurrle twice saw efforts blocked as the clock wound down. 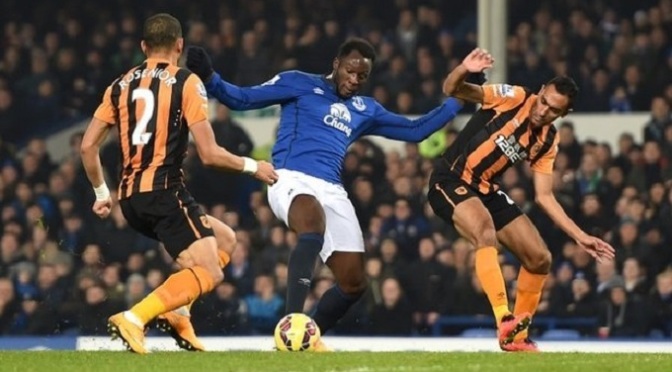 Hull ended a run of four consecutive league defeats thanks to Sone Aluko’s second-half equaliser at Everton. Substitute Aluko twisted and turned defender Sylvain Distin before firing a low, angled shot past Tim Howard. Everton took the lead when Romelu Lukaku fired in his sixth of the season from Kevin Mirallas’ pull-back. Lukaku also had a late shot blocked by Craig Dawson, while Hull’s ex-Toffees striker Nikica Jelavic headed inches wide. It was Everton’s central defence – their Achilles this season – that cost them victory against the visitors. There were signs that it could prove a problem again when Jelavic twice brushed off the attentions of Distin – and it was the French defender who was at fault for the Hull equaliser. Aluko, a replacement for the injured Mohamed Diame six minutes earlier, surged past the former Newcastle and Portsmouth defender down the left before rifling a low shot beyond the reach of Howard. Hull then should have gone ahead moments later when Jelavic exploited more poor defending but the Croatia striker headed his effort inches past the keeper’s right-hand post. It had all begun so well for the home side, who were looking to bounce back following their weekend defeat against Tottenham. Lukaku was particularly prominent, combining a muscular ability to hold off defenders with a willingness to track back for his side. But it is his prowess in front of goal which prompted Martinez into making him a permanent signing during the summer, and after a slow start he is starting to prove his worth. He scored his latest goal – his third in four matches – after combining with Belgium team-mate Mirallas. The winger was in menacing form in the first half and picked out Lukaku, who converted the chance despite being at full stretch. The £28m striker, who had an early firm effort well held by Allan McGregor, had a shot blocked by Dawson as Everton pushed for a late winner. That was one of Everton’s few clear-cut efforts on goal after the break though, and despite eight minutes of stoppage time they failed to trouble McGregor again.